Anne Van Schaik is corporate accountability campaigner for Friends of the Earth Europe. Multinational companies affect the lives of people and the environment all over the world. The ten largest multinationals make more money than the 180 poorest countries combined so those impacts can be far-reaching. Yet there are no real international binding instruments to hold companies accountable for the harm they might cause, and in many countries, victims of corporate abuse may not even have access to justice. Voluntary measures abound. Take for example the covenant for the Dutch banking system from last year, that saw civil society, the private sector, and banks, under facilitation of the Dutch government agree to respect human and labour rights. Dutch bank Rabobank is one of the signatories. One month after signing, Amnesty International published a report showing forced and child labour at plantations of the palm oil company Wilmar. Rabobank has loaned more than $900 million to Wilmar since 2011. Friends of the Earth has repeatedly highlighted problems with Wilmar plantations in Africa and Asia, yet the bank continues to provide loans, despite the multitude of voluntary codes of conduct they claim to adhere to. Voluntary measures are obviously not enough. In 2015, 185 people died defending their land, forests and rivers against destructive industries. Take the tragic case of the assassination of Berta Cáceres, murdered on 3 March last year for her role in resisting the AguaZarca hydropower project funded by the Dutch and Finnish development banks FMO and Finnfund. Both banks had policies in place to prevent them from engaging in projects denounced by indigenous people, yet they ignored all the warnings and went ahead. With terrible consequences. This needs to change, and last year the seeds were sown for an international agreement that could put human rights before corporate interests. 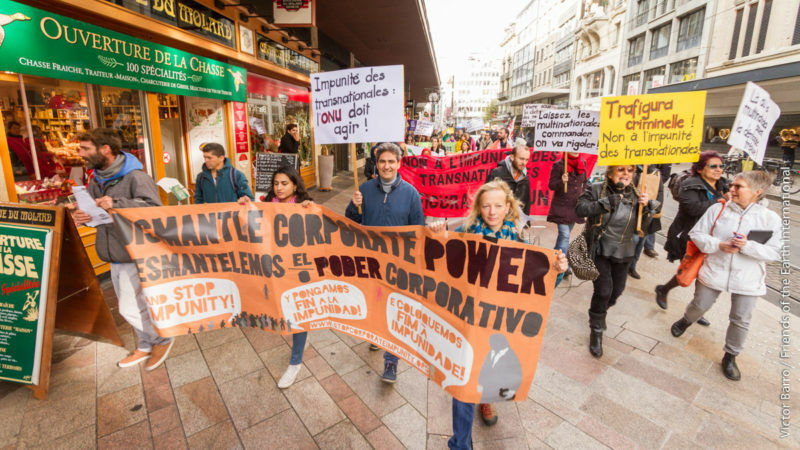 The UN Human Rights Council (UNHRC) is preparing a set of legally-binding rules for transnational corporations in relation to human rights known as “the UN treaty”, and on 9 March they will be taking the next steps nurturing it into life. The UN treaty intends to protect people from human rights abuses by corporations and bring corporate actors to justice, and the implications for the world’s largest companies and their supply chain will be profound, obliging them to respect human rights in a way they have never had to before. The European Union now has an unprecedented opportunity to put human rights before corporate rights by continuing discussions around the UN treaty next month and putting some serious meat on the bones – to constrain and control big business, and to deter and punish human rights abuses by the world’s largest companies.